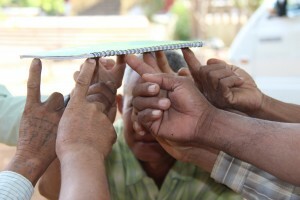 In August 2016, the U.S. government, through the United States Agency for International Development (USAID) announced a three-year award (https://kh.usembassy.gov/usaid-announces-project-promote-healing-reconciliation-victims-torture-khmer-rouge/) for TPO to implement a new project called ‘ Healing and Reconciliation for Victims of Torture of Khmer Rouge Trauma’. This work will be carried out in collaboration with the Kdei Karuna Organization (KdK) (http://www.kdei-karuna.org/) and The Center for Victims of Torture (CVT) (http://www.cvt.org/). TPO Cambodia and KdK have been two organizations leading the way in projects that address community healing and reconciliation for victims of torture of KR era. This program brings together the strengths of the two organization in a project that seeks to address healing of both community and individual level. Under this project, TPO and KdK will leverage their substantial experience to provides interventions to individuals and communities affected by Khmer Rouge era trauma and more recent GBV and to support affected individuals to access their right and to achieve justice and healing. TPO continues collaboration from previous project with CVT to improve the capacity building development in three domains: clinical mental health service, monitoring and evaluation (M&E) and organizational development (OD). This three years project (2016-2019) aims to promote trauma healing for individuals and communities experienced torture during the KR time and strengthen resilience and thus enhance their capacities for peaceful conflict resolution. improve mental well-being for victims of torture through increasing access to mental health services, and truth-telling and memorialization processes that treat and heal trauma caused by torture at individual and community levels. improve the quality of mental health services to victims of torture through vigorous capacity development for therapists, and documentation of the evidence of effective intervention. The targeted groups are individuals who were tortured during the Khmer Rouge (KR) regime and are still struggling with trauma symptoms, civil parties at the ECCC, victims of KR gender-based violence (GBV), local facilitators, family and community members who may have been affected by torture during the KR regime, and children of victims of torture. This project will be implemented in 15 communities in 15 provinces, including: Kratie, Svay Rieng, Tbong Khmom, Kampong Chhnang, Siem Reap, Pursat, Kandal, Kampong Thom, Kampong Cham, Battambang, Kampot, Takeo, Prey Veng, Mondulkiri and Kep. TPO and KdK staff will interview villagers, commune and district authorities, Community Based Organizations (CBOs), NGOs, pagoda commitees and other stakeholders in order to understand the needs of the community, to assess problems and identify the severity of psychology distress among victims of torture and select key resource people as well as local facilitators for the project. We identify, select and provide training on the community dialogue method and basic psychological support and conflict resolution. The LFs will play a key role to assist the project in organization community dialogues and primary mental health support for victims of torture. We conduct Psycho-education to increase understanding and awareness of trauma and mental health, allow victims to seek help on time, and address stigmatizing and other detrimental attitudes. 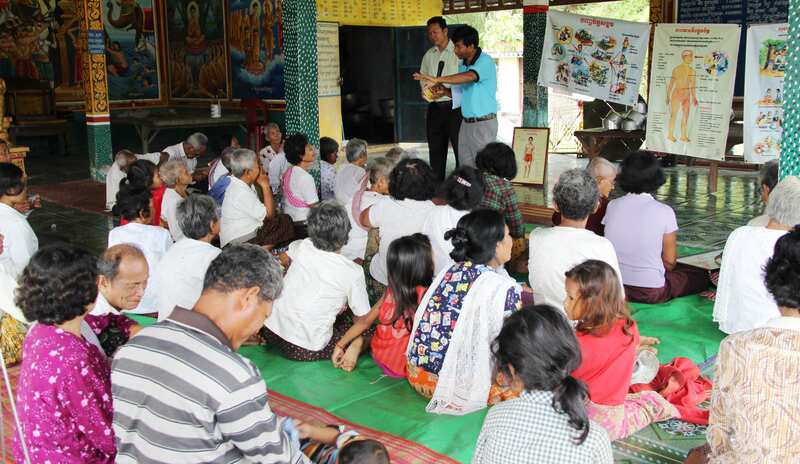 IEC material (film, posters, leaflets…) are used to provide information to the participants. General psycho social problems such as domestic violence, discriminatory gender norms, violent behavior, or alcoholism are addressed in these sessions. Self-help groups to provide victims of torture a safe place where they can meet, find understanding, and express their feelings. This sessions are conducted in local community settings and appropriate for victims of torture who have more severe psychological problems (Civil Parties or community members). Each group consists of between 6-10 members. Testimonial Therapy (TT) for victims of torture to foster their psychological healing and improve their social functioning. Depending on the beneficiary, the TT intervention can be implement in Phnom Penh or in their community over the course of five days. An additional 2-3 telephone support sessions are provided after the intervention. Exploratory history education (EHE) to teach the process of reconciliation and peace building. In close collaboration with Local Facilitators, KdK will facilitate victims of torture and youth participation and ensure appropriate preparation and follow up. Local Facilitators will act as multipliers leading to a trickle-down effect in communities, peer groups and families and are encouraged to promote intergenerational dialogue. To help raise public awareness and knowledge, and reduce mental health bias, TPO and KdK will use a variety of Truth-telling and community-based dialogues formats that support victims to come forward to share their stories as means of giving voice to the full scope and breadth of the KR atrocity. Target groups includes community members, victims of torture, youth and local authorities. Client-centered counseling is provided between 6-12 sessions over a period of 6 months. The service offers emotional support, psycho-education and problem solving. Victims of torture who may still have the need of mental health care will receive follow-up counseling/treatment through telephone, depending on their location. The onsite psychosocial support at the ECCC differs from the other interventions outlined above. Support is provided through grounding technique and emotional support (psychological first aid) to help the clients deal with the emotional stress related to attending proceedings. Psychological support will be continued by TPO counselors via telophone in order to make sure that CPs feel safe psychologically after the courtroom testimony. To improve the quality of mental health services to victims of torture, TPO/KdK provide vigorous capacity development and document evidence regarding the effectiveness of psychosocial intervention and best practices. With its partner CVT TPO will keep ongoing capacity building on three domains such as clinical for clinicians/therapists using the Unified Clinical Approach (UCA), Organizational Development for senior staff and Monitoring & Evaluation part for the organization. TPO and KdK will document the testimonies of victims of torture and victims of GBV (past and current). This document is a form of acknowledgement of the pain and suffering of victims of torture. TPO and KdK will also document the best practice through collecting data from the progress report, case study, and observation note and supervision/monitoring report.